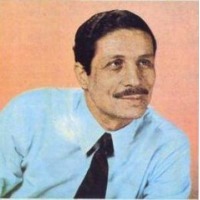 Dahmane El Harrachi (real name Abderrahim Amrani), born on July 7, 1925 in El Biar, Alger, Algeria-died on August 31, 1980 in Alger, Algeria, was an Algerian Chaâbi singer of Chaoui Berber origin. He is mostly remembered for his song "Ya Rayah" which has since been made famous again by Rachid Taha. He moved to France in 1949 living in Lille, then Marseille, before eventually settling in Paris. It was in Paris where he made a name for himself, playing in the numerous Algerian cafés present there. He died on August 31, 1980 in a car accident on the highway in Algiers. His father, originally from the Chaoui village of Djellal in the province of Khenchla, was the Muaddin at the Great Mosque of Algiers.